PicoSure’s ultra-short pulse duration goes beyond photothermal action creating an intense photomechanical impact, patented PressureWave™, resulting in greater disruption of the target for better clearance with fewer treatments, less fluence and without injury to the surrounding skin. 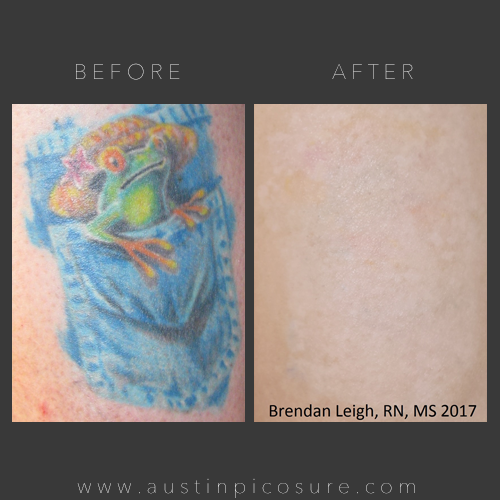 Even dark, stubborn blue and green inks, as well as previously-treated, recalcitrant tattoos can be removed. 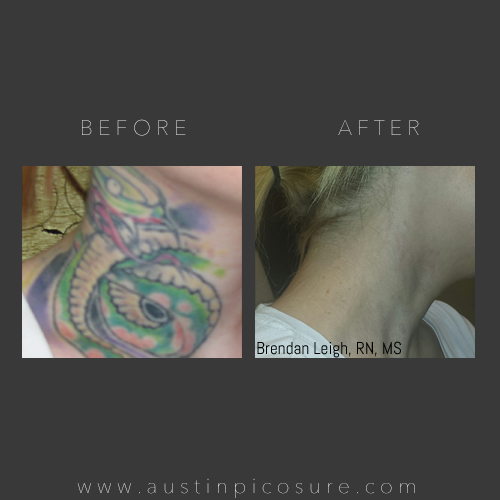 Does it take a lot of treatments to remove a tattoo? It doesn’t now with the use of PicoSure™! Previous methods were invented to remove old India ink from old-style sailor tattoos which could take up to 20 treatments to remove modern tattoos. What makes PicoSure™ more effective than Q-switched lasers with decades old technology? 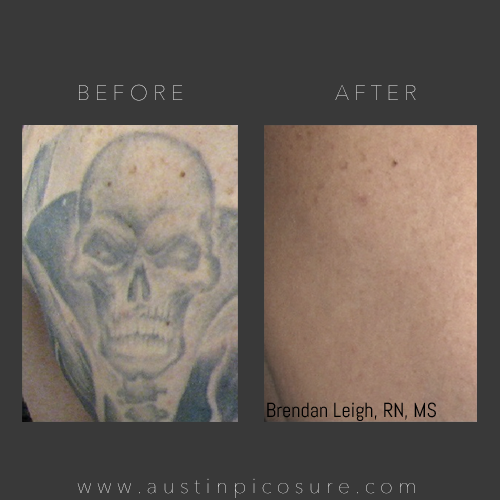 The PicoSure™ laser pulses so quickly (in trillionths of a second) that it produces a powerful patented PressureWave™ that shatters ink particles in to pieces small enough for the body to remove. Q-switched lasers, on the other hand, fire so slowly (100 times slower than PicoSure™) that they cannot produce a PressureWave™. Will I blister and why? Most likely you will experience some blistering. In the case of a Q-switched laser, the blistering is thermal in nature, meaning the skin got burned. With PicoSure™, the blisters are not thermal, but are actually caused by the PressureWave™ vibrating across the skin, almost like friction. How long do you wait in between treatments? Generally treatments are spread 4-8 weeks apart with the average being 6 weeks. This interval depends upon the size of the tattoo, location and several other factors, such as individual patient healing times. Is black really the easiest ink to remove? It used to be before PicoSure™ lasers were invented. Back when Q-switched lasers were the only thing available, they took off black tattoos best because they are ineffective on colors. Check out our PicoSure Skin Care Treatments!